Forty minutes later, we stood on a rocky ledge looking down over Santa Fe with a group of Argentinians who’d passed us 10 minutes before. We took the obligatory selfie and sat down on the rocks to take in the view. The breakfast cook/owner of our B&B had sold us on this trail. We cursed him on the way up when we slid through the snow and struggled to find the trail markings. But now, looking out over Santa Fe National Forest to the horizon line of a cloudless blue sky, we took those words back. Santa Fe visits can go highbrow — the Georgia O’Keefe museum and a run up Canyon Road through all the art galleries — or lowbrow — hiking up mountain trails and hunting the best green chile cheeseburger. This trip was all lowbrow. And after 20 minutes of taking in the views at the top of Atalaya Mountain, we had just two things in mind — green chile cheeseburgers and beer. The 1,800 foot descent only sharpened our appetites. Five-and-a half hours after we’d started, we were sitting at the bar at Second Street Brewing’s restaurant in the Railyard District, replacing whatever calories we’d burned off with green chile cheeseburgers and a side of green chile cheese fries. Double lashings of american cheese, which I know I shouldn’t like because it isn’t really cheese, but the creamy gooey-ness of it blended well with the chile bite. We chased it down with a pint of their Boneshaker Bitter, one of the better American-made ESBs I’ve had. It was the end of November and the temperature was dropping as we made our way back to our B&B, the El Farolito. We had our own little casita out front. Walking in, we saw that housekeeping had the kiva fireplace ready for us, loaded with a triangle of piñon logs over some kindling and a stack of yesterday’s newspaper off to the side. The fire caught with one match (gotta love well-seasoned wood). As the smoke rose up the chimney, I walked back outside and was immediately hit with the piñon smell, that unique pinewood smoke smell I only get in Santa Fe. I’ve been around a lot of pinewood fires in, say, Colorado and Arizona, but the piñon smoke billowing out of a kiva fireplace is a unique smell; one that I love. It was a cold hike up the trail this morning; here was a little payback. The next morning, after tucking into another great breakfast, El Farolito’s cook/owner/travel guide recommended we head out to Tent Rocks for our next hike. It would be a completely different environment, hiking through towering volcanic rock formations rather than a forest, and at 600 ft, it would only be a third of yesterday’s climb. However, Tent Rocks is a popular place that caps the number of people it lets in. The forecast was for a sunny Saturday, so we needed to get on our way or risk waiting in line to get in. This was made much easier by our choice of rental car. When we hit the Hertz Presidents’ Club aisle at Albuquerque airport Thursday afternoon, it was pretty picked over; just a very odd selection of Dodge vehicles — Dodge Challenger muscle cars or fully tricked out Ram Hemi king-cab pick-ups. I can’t say that I’ve ever faced quite that choice at Hertz before. The Challenger, with rear-wheel drive, wouldn’t be great if we got snow at elevation, but the Rams were just huge, trying to parallel park one in downtown Santa Fe would be an event. I stood between them, went back and forth for a couple of minutes. “Just pick one,” Irene said, “it’s a rental car, not a life choice!” I went for the white Challenger and hoped for clear skies. And on this Saturday morning, that’s what we had — and a 75 mph speed limit on the southbound stretch of I-25 between us and Tent Rocks. I put my foot into the Challenger and kept it there as we exited the interstate and drove down and west across a flat plateau on Rt 16. I didn’t ease up until we hit the residential streets of the Cochiti Pueblo reservation. It was around 10:30 am when we turned onto the access road, expecting to hit the line of waiting cars. We were hugely relieved when we drove straight up to the entrance booth, paid the $5 fee, and continued on to the trail head parking. Walking sideways and single file through the narrowest parts of the slot canyon at the start of the Canyon Trail, we immediately understood and appreciated the capacity limit. Without it, the trail would’ve hit gridlock. And we didn’t mind the times when we had to wait for a downhill group to clear a tight squeeze. It gave us time to look up and appreciate the rough beauty left behind by 6-7 million years of erosion. Coming out of the slot canyon, we hit the steep section. “Do you think it’s worth it,” a dad asked, struggling up the incline with his daughter and a load of snacks on his back. 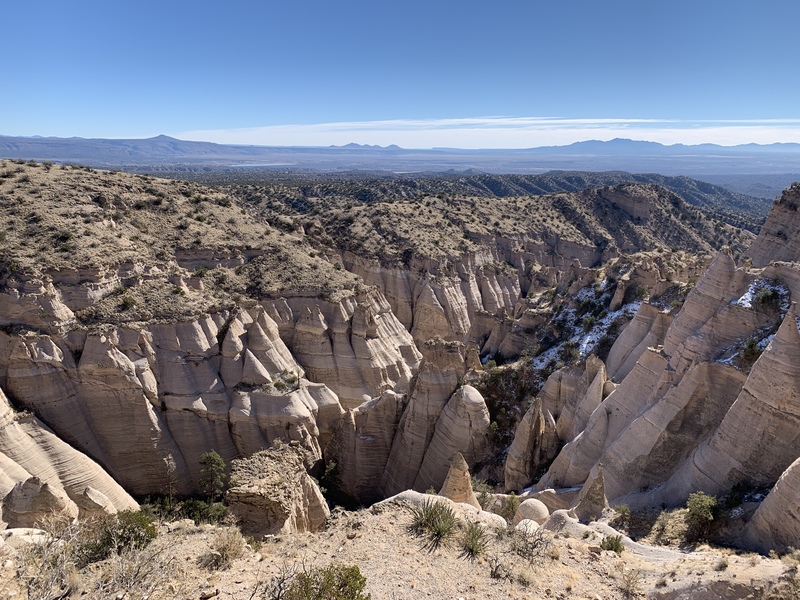 When we got to the flat mesa on top, the answer was there spread out for us when we looked down onto the 90-foot tent rocks (hoodoos), and then out across the Rio Grande Valley and to the Sangre de Cristo mountains in the distance. The temperature hit 50°F. We shed a couple of layers of clothing, dangled our legs off a rock ledge, drained our water bottles, and looked out with nothing between us and the horizon. It was our second day of cloudless blue skies and hundred mile vistas. When we drove out around 1pm, we passed a line of cars waiting at the entrance booth to get it. The line ended between signs estimating the wait time to be 30 and 60 minutes. I patted the Challenger’s dashboard. Driving back to Santa Fe, we got off of I-25 an exit early and drove up Rt 14 through what felt like the real life Santa Fe. No art dealers and kachina shops; instead, the typical string of auto dealers, gas stations, and shopping centers anchored by Targets and drive-thru Starbucks. We were headed to Rowley Farmhouse Ales for another post-hike green chile cheeseburger. The Rowley burger was a bit more upscale than yesterday’s — the menu namechecks local purveyors of the beef, bacon, and cheese (but not the green chile!) on the burger — but still a very solid burger. The beer list was one of the strongest we’d seen. Flights of tasters let us sample Rowley’s own beers — a nice range of IPAs, saisons, and sours — and some of the local guest beers they also had on tap. That evening, we walked over to Guadalupe Street, which feels like the lowbrow counterpart to the plaza or Canyon Road. We stopped first at Cowgirl BBQ for some margarita nostalgia. 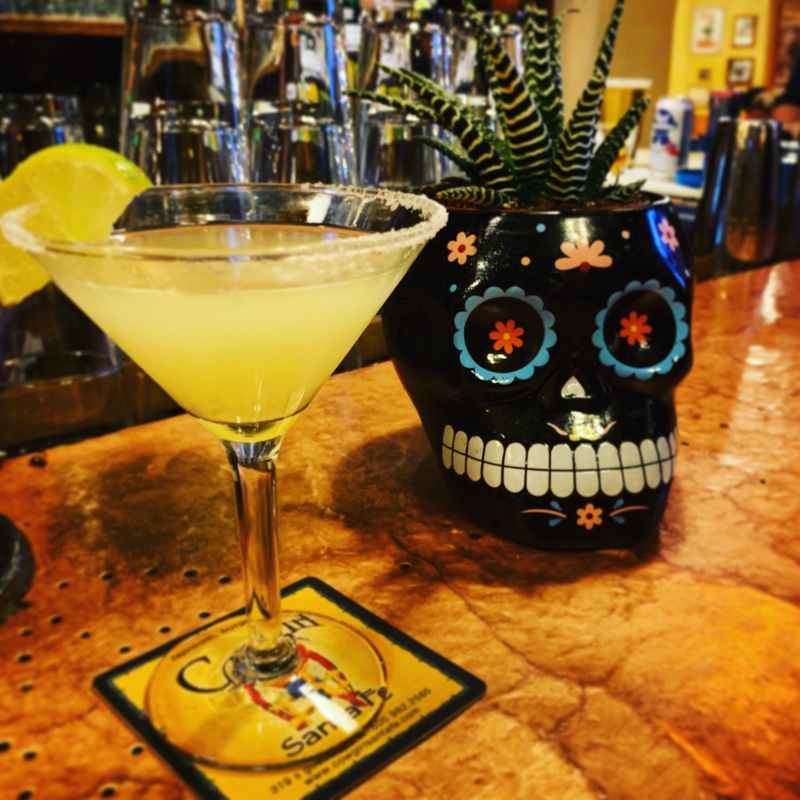 On our first trip to Santa Fe, I was on the hunt for a great everyday margarita recipe and after a weekend of margarita tasting, we picked Cowgirl’s. We worked our way through their current margarita menu, listening to a group of local guys at the end of the bar talk to the bartender about taking dancing lessons. “God, I missed you guys,” the bartender said. We walked a couple of blocks further down Guadalupe Street to Tomasita’s for dinner. The alcove was full of families and big parties. The hostess gave the party of 6 in front of us a 2-hour wait. For Irene and I, just an hour. We headed to the bar to try their margaritas. When we were seated (15 minutes early! ), we searched the menu for something different. Most of it was the standard enchilada and taco combo plates, but with a little patience, we found some unique dishes. Carne adovada, the classic New Mexico pork and red chile braise, had a deep earthy chile flavor that made me seriously question my green chile fixation. I saw that we could have chicos as our side. “What are chicos?” I asked the waitress. “Oh, you’ll love them.” More of a recommendation than an explanation, but I ordered them anyway. Turned out that Tomasita’s chicos are a New Mexico spin on a Native American staple, whole beans mixed with whole corn kernels that have been steamed over a fire. The texture of the whole beans and the smoky sweet taste of the corn kernels were such an improvement over the pasty blandness of refried beans, I wondered why chicos weren’t the standard side. And in place of the usual tortillas, we got a basket of fresh sopapillas with honey butter. Nothing fancy; it was homestyle New Mexico cuisine. Sunday morning looked like another bright blue day — from what we could make out through the frosted window. Our legs felt a bit heavy after two days of walking up steep inclines so we decided to go for some flatter terrain, a walk through town. We walked along the Santa Fe River Park, looking down at the frozen trickle of what we assumed was the Santa Fe River. We veered up Canyon Road. None of the galleries were open yet, but there was enough sculpture in the front and side yards to fill our lowbrow culture quotient. By noon, we had walked off last night’s dinner, so we circled back around to Alameda Street and headed back into town toward the plaza to find some lunch. We read the menus of the restaurants ringing the plaza. Nothing really excited us until I spotted a couple of food carts on the west edge of the plaza, a Mexican guy on the southwest corner selling tamales and a Nigerian guy on the northwest corner selling goat stew. I bought two tamales, beef with red chile and chicken with green chile. We crossed the street, ducked out of the wind, and scarfed down what were excellent tamales. It seemed the perfect lunch to end our lowbrow Santa Fe weekend. 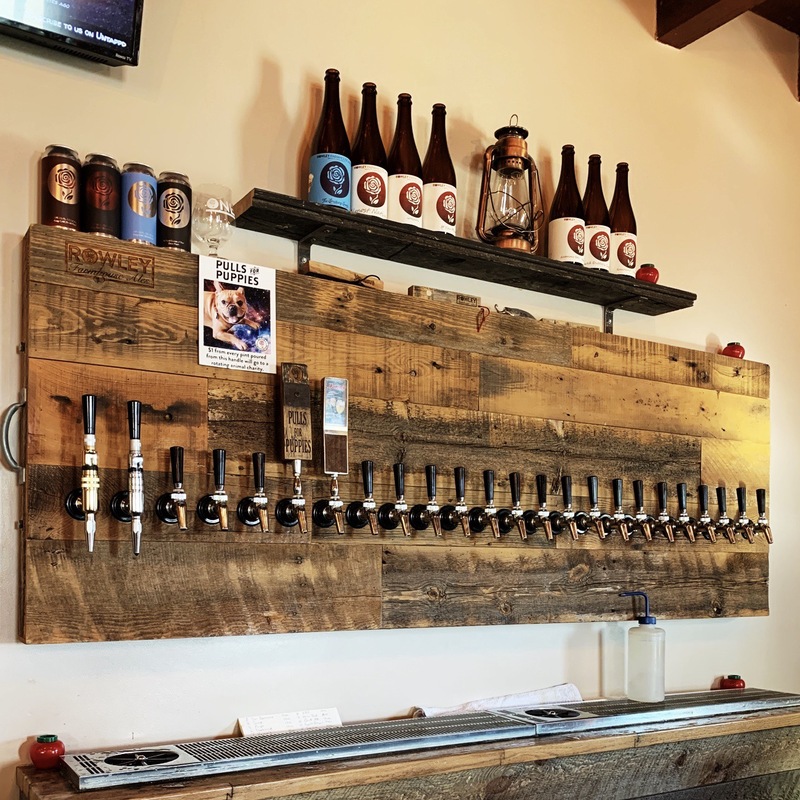 Great write up on one of our favorite places to visit. And I learned of a couple new stops from your article. And thanks for that Chicos shout-out – now I’m craving New Mexico Cuisine. Perhaps a batch of Carne Adovada should be in our weekend plans.